Anurag Kashyap's Gangs of Wasseypur exploded onto the international film scene with a Cannes 2012 premiere that garnered a cascade of superlatives and wound its way around the Earth to finally land a proper US release beginning on January 16, 2015 at the Film Society of Lincoln Center (FSLC) in New York. To celebrate this truly momentous occasion, distributor Cinelicious Pics has cooked up this rockin' trailer packed to the gills with guns, explosions, guns, running, guns, nasty characters, and more guns. While the film itself unwinds over the course of five and a half hours to tell a story 70 years long, the keeps things short and snappy. No plans have been announced beyond the FSLC opening, but I assume that a limited theatrical release is on the cards. All indications point to Gangs of Wasseypur's initial run at FilmLinc being the full 320 minute experience, which is a lot to digest and a tough sell to theater chains, even those that cater to art house fare. Hopefully more plans are announced down the line that will allow filmgoers in other cities to experience the film in the most ideal circumstances possible. In the meantime, get ready to have your mind blown. Hey Dallas! 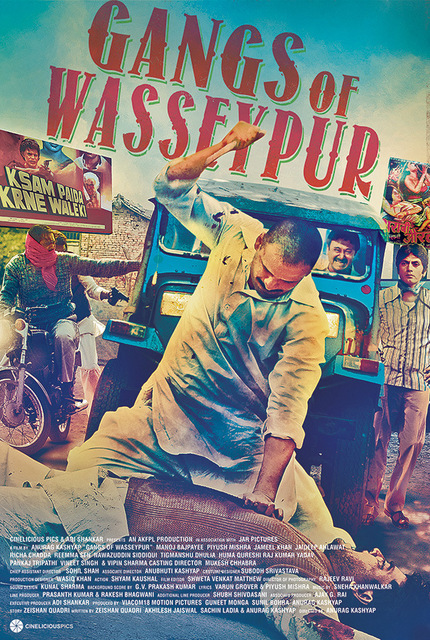 Win Tickets To See GANGS OF WASSEYPUR Courtesy Of The Texas Theatre And ScreenAnarchy! Holy shite, I have eagerly awaited this film and cannot wait to see it, especially since I just watched this awesome trailer. Thanks for posting J.